Intuitive Music Aberdeen is a pretty unique ensemble, in Aberdeen at any rate. It is a trio of creative artists who come from very different areas of endeavour all of which find their way into their music. It has all been written or devised by one or several of the members of the ensemble. 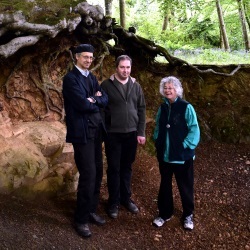 Haworth Hodgkinson is a poet, playwright, composer and improvising musician, Mandy Macdonald is a writer and musician with a classical music background, especially in choral music, while Colin Edwards has a background in folk and traditional music. Their sound world contains elements of all of these and since the concert I attended before this one was one of Pete Stollery's electro-acoustic concerts, I sensed connections with that musical world too, the great difference being that while the electro-acoustic compositions tend not to have any live performers in action before the audience (this is not always entirely true) the sounds produced by Intuitive Music Aberdeen are all delivered live "before your very eyes or ears"! The three works in Saturday's programme were very different. Thinking about how much of it was improvisational or "on the spot", with, in one case, members of the audience being asked to choose three individual pages from a much longer manuscript as the source material for the music, I had thought that much of the music would be utterly shapeless and chaotic. To my surprise, nothing could have been farther from the truth. What impressed me most about Saturday's performance was the structural integrity and shapeliness of all three contrasting works. This made me think of yet another musical source that could be part of Intuitive Music Aberdeen's resources, namely jazz. I have always been amazed by the extent to which jazz musicians seem able to read one another's minds during a performance and to react to one another. This was obviously something that lay at the very core of Saturday's performance, and it was really impressive. The first piece in the concert by Haworth Hodgkinson was entitled Freak Out. To begin with, the title mystified me. 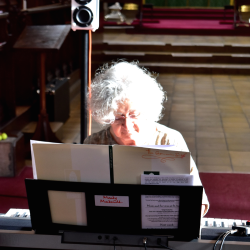 Mandy Macdonald on keyboard was at the front of the audience. Haworth on recorder and Colin on bowed psaltery were unseen at the back of the cathedral. 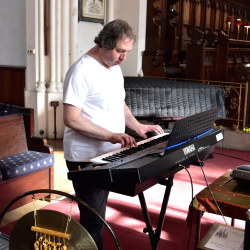 Mandy produced floating bell-like chimes on the keyboard while Colin came in with unearthly reedy notes on the psaltery and Haworth with gentle lower notes on recorder. The result was mysterious, archaic, suggesting that the title should have been From the Medieval Cathedral. The sounds matched our surroundings quite nicely although St Andrew's Cathedral is a relatively modern building. Suddenly within this gentle antique sounding music the recorder and then the keyboard changing to drum sounds provided quite startling explosions of sound – so okay then Haworth, I got the meaning of your title, Freak Out. The second piece in the concert, Economic Suite was in three sections, some of which were themselves sub-divided. The titles were quite astonishing, not what you would normally associate with music. Mandy Macdonald had composed the first of the sections entitled Relationship between wage and unemployment at regional level. 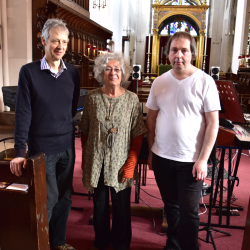 It was a keyboard trio that sounded both spiky and atonal (though it was not strictly that). The second section, the one where members of the audience were asked to choose source material, had keyboards and important percussion content with members of the ensemble speaking words from the chosen texts. This was Non-payment of wages, by Haworth Hodgkinson. Croatia and GDP were just some among the most regular utterances. Of course the words themselves were unlinked in any respect of making sense but were intended to come across to the audience in a purely musical way. It was their sounds that mattered, not their sense. They provided a kind of punctuation giving shape to the music. I thought that worked rather well. Colin Edwards had his name connected to the final section of the suite entitled Productivity: GDP per worker. Here the keyboards merged together in slow movement carefully conducted by Colin. Just as Pete Stollery can create music from the most surprising and perhaps unpromising sources, here was a fascinating and I thought enjoyable piece of music from a quite astonishing source. Life and joy extracted from the most dry and tedious science, Economics. Sorry you economists, but that is just how it is! The final piece in the concert for three keyboards was entitled simply Improvisation. 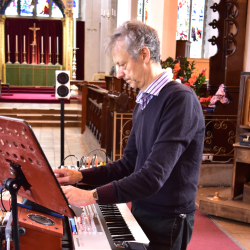 At the beginning, Haworth's keyboard produced harpsichord tones, Mandy's was like a harmonium and Colin provided a bass line that was not always at the lower end of the sound spectrum. As the work advanced, there were even rather beautiful choral sounds. We should of course commend the inventors of modern keyboards for the ability to produce such a wide range of sounds so easily. The piece may have been an improvisation for the three players but they blended together so well. It was that which reminded me of the world of jazz and how three performers seemed to work almost as one. A great deal of thought and care must have gone into this performance. More often than not, when you go to a concert, you have some idea of what you're about to hear. You've listened to the music on the radio, bought the album, sung the hits in the shower. None of those things apply to Intuitive Music Aberdeen, but not in a bad way. Their inspired performance in the beautiful surroundings of St Andrew's Cathedral, some of it improvised, a large part of it randomly generated by the musicians on a range of instruments, was strangely mesmerising, hypnotic even and yes, also moving. This style of music can be challenging to listen to on occasions and a lot of people would actively avoid it. Indeed, on Saturday, I wasn't sure what to expect. Improvised music? Scary! But no, I soon learned that it's all a matter of having the right mind-set. One way of approaching it might be to imagine you're looking over the shoulder of an artist as they begin a new abstract painting. They start with a blank canvas and begin to apply the paint. As you watch, you've no idea what the picture is going to look like at the end and you don't know what brush-strokes, or colours they're going to employ along the way. Each is a surprise and as time goes by, as the colours and textures build, you lose interest in what the picture might become and instead you become absorbed in the process iself, as each small element is applied. That is, I discovered, how to listen to improvised, or in this case "intuitive" music. Clear your mind, create a "blank canvas" and then allow the music to paint pictures inside your head. For example, in the central section of the concert, a piece entitled Economic Suite, the three members of the group, Mandy Macdonald, Colin Edwards and Haworth Hodgkinson, showed great control as they performed. I found myself drawn in, constantly surprised by the sounds, but at the same time reassured by the gentle notes and rhythms that these talented musicians created literally in front of us. They were in control of the piece at all times and I always had the confidence that they would never let it descend into what could have been, in less skilled hands, a horrible cacophony. At intervals throughout the piece, they each read words from a "script", which in turn resulted in a sound created on the instruments before them. Genius! My only criticism and a purely technical one, is that some of those words were lost, drowned by the accompanying music. I feel it would have been better if they had used microphones to bring these words more to the fore. But that is a small debateable point in what was otherwise a joyous experience. Afterwards, as the audience mingled with the group, discussing what they had seen and heard, I got the distinct impression that everyone had enjoyed themselves. Some people like me were surprised, others seemed reassured that this type of musical performance is alive and well and being performed in the North-East of Scotland. Improvised music, or any music that does not conform to normal conventions, is not for everyone, but in the case of Intuitive Music Aberdeen, if you discard all preconceptions of what you are about to experience, if you allow the group to "paint pictures" in your head, if you relax and have confidence in the skills of the musicians, I can assure you that they will not let you down.